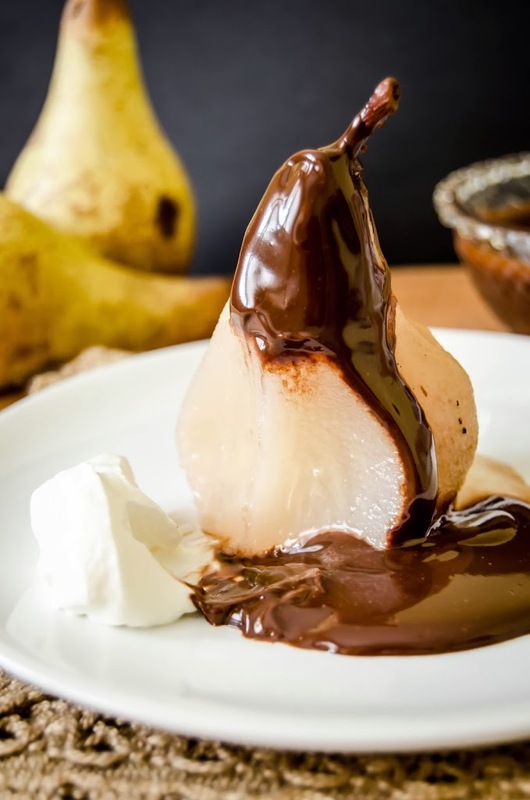 Poire Belle Helene e un desert pe baza de pere posate intr-un sirop aromat de zahar, servite apoi cu un matasos sos de ciocolata si un mot de frisca sau inghetata. Eu le-am facut si un guler de tuile (un fel de fursec foarte subitre si crocant). Au fost mai mult decat delicioase, un desert cu adevarat decadent, ciocolatos, perfect! Pentru a posa perele, se combina apa, zaharul si restul ingredientelor si se pun pe foc. Intre timp, se curata de coaja perele si se scoate cotorul astfel incat para sa ramana intreaga. Se fierb perele aproximativ 40 de minute pana devin moi. Se lasa sa se racoreasca in sirop. Pentru sosul de ciocolata, se aduce frisca lichida la punctul de fierbere apoi se ia de pe foc si se adauga ciocolata si sarea. Se amesteca pana se topeste si sosul e omogen si se adauga romul. Pentru a face tuile de migdale, se amesteca toate ingredientele. Se intinde un strat subtire pe o foaie de copt si se coace 5 minute la 180C. Se scoate din cuptor si se taie cateva cercuri mici cu un cutter de fursecuri, apoi se decupeaza cu un cutter mai mic centrul fiecarui tuile, exact ca in imaginea de mai jos. Se mai coc 10 minute pana devine usor aurii. Pentru a servi perele, se toarna sos de ciocolata pe fiecare para si se aseaza tuile-ul de migdale pe fiecare para. Se serveste de preferabil cu inghetata, insa in lipsa, merge de minute si un mot de frisca. To make the poached pears, mix the water with the sugar, cinnamon stick, cardamom, star anise, cloves, vanilla and lemon peel. Bring to a boil. In the meantime, peel the pears and remove the core carefully, leaving the pears intact. Place the pears in the hot liquid and cook them on low heat for 40 minutes. Turn the heat off and let the pears cool down in the syrup. To make the sauce, heat the heavy cream in a small saucepan then stir in the chocolate. Mix until melted then add the salt and dark rum and let it cool down before using it. To make the almond tuiles, mix all the ingredients in a bowl. Spread the mixture into a thin layer on a baking sheet. Bake at 350F for 5 minutes. 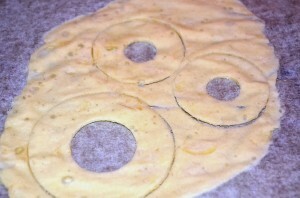 Remove from the oven and cut small circles with a round cookie cutter. Cut a smaller circle in the center and place them back in the oven. Bake them for another 10 minutes until golden brown then remove from heat and let the tuiles cool down. They will be soft when you remove them from the oven, but will turn crisp as they cool down. To serve the pears, place them on a serving platter. 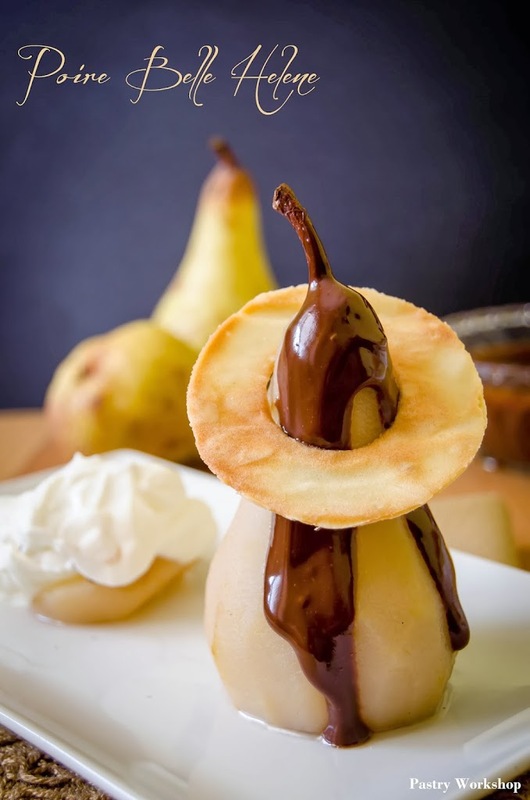 Place one tuile on each pear and top with chocolate sauce. Add a dollop of whipped cream or a scoop of ice cream before serving. I love that GIF! I’ve always wanted to try poached pears. Gifs are fun indeed, but they require quite a lot of time to put together unfortunately. Wish I had the time to make more of them.